poor ethical leadership of police commissioners, lack of personal integrity of police officers, unethical culture within police departments, mismanagement, corruption, lack of corporate governance regulations, no transparency, racism, no commitment to change, and lack of the right tools & techniques to change sustainably are the main contributors of all these police shootings and killings. This is becoming an epidemic in America . Hiring thousand more police officers, focusing on police officers wearing body cameras, and extensive training will not solve this problem. The police officer in Charlotte did not wear a body camera during the fatal shooting and the fatal encounter in the Eric Garner Chokehold Case and the killing of Walter Scott by Michael Slager, an officer with the North Charleston Police Department, were captured on videos very clearly and seen around the world, but did not matter. All these police officers had plenty training. So thousand more police officers, body cameras, and more training are not the right solutions and provide no protection from all these catastrophic ethical failures and killings. We need a sustainable and innovative solution to this epidemic urgently. THIS ARTICLE PROVIDES THIS SUSTAINABLE SOLUTION. It’s very disappointing and strange that Police Departments are still not committed to learn and to change sustainably after all above mentioned shootings. A sustainable and holistic solution is urgently needed, which means that not only the Police must change, but also most of the African American youth! One of the forgotten aspects of Dr. King’s legacy is how he demanded personal responsibility of the African American community. Nobody focused on this aspect in the past 50 years, not even Barack Obama, because there were no effective systems in the US available to solve this problem adequately. This needed behavior change counts for the whole US society, not only for the African American youth. So focusing on the police, body cameras, and training only will not make a difference. In this article we provide a holistic solution to this growing problem, which also includes an effective and proven way to develop personal responsibility of the African American youth so that they can create their own job opportunities, just like thousands of others have done globally in the past ten years based on our proven methodology. We have also applied this innovative system at some police forces abroad and it has proven to be very effective (see below success stories). Why are US Police Forces still not committed to learn from these examples and from their own mistakes? How many innocent people must die first before they take effective actions? We need a more sustainable, authentic and holistic approach to this growing epidemic urgently and create a complete rebirth of trust in police officers. Rebuilding trust in the police department starts with rebuilding trust in its police officers. Rebuilding trust in the police officers starts with police officers being authentic and aligned with themselves. This results also in their development of personal responsibility and social responsibility. This process of cultural change counts also for the African American youth. It can be realized via individual coaching and mentoring of police officers and African American youth with our Harvard Business School and MIT Sloan endorsed innovative Authentic Personal Brand Coaching system developed by the Innovative University of Silicon Valley. Each police officer should be coached individually and undergo this organic process of personal change. African American community leaders must undergo the same process during coach-the coach and train-the trainer sessions, so that they can coach and train the youth in their community themselves and develop their self-responsibility based on this coaching system. This special program is geared to police officers, police commissioners and African American community leaders who wish to enhance their effectiveness, become a value based leader, attain their full potential, and create awareness for personal integrity and self-responsibility. a) The African American community leaders must train and coach the youth in their community based on this system to develop their self-responsibility and to redefine themselves. Remember what Albert Einstein said: “In the middle of difficulty lies opportunity“. By developing their self-responsibility, engaging in a meaningful dialogue with themselves and redefining themselves, African American youth and other Americans can create their own job-opportunities and grow actively. Please check our article “A 4-Point Survival Guide for Turning Personal Financial Crisis into Opportunity” how we have helped about 15000 people globally in the past 10 years to create their own job opportunities based on this highly effective system. b) The police commissioner and his/her executive team must redefine the police department’s brand and strategy, implement effective talent management, implement an integrated corporate governance system, etc. based on our innovative authentic governance system . Some ingredients of this sustainable corporate governance system are: code of conduct, conflict of interest policy, compliance with applicable laws and regulations, description of department’s social responsibility, personal responsibility of police officers, combating corruption, bribery and racism, establishing a whistleblowing program that provides a framework under which any person having information or knowledge of violation to the police department’s corporate governance policies can come forward and report without any fear. The US has around 500,000 police officers and a total of 40,000 separate police forces. There’s no police force in the country, where police officers are coached individually to manage themselves effectively, develop awareness for personal integrity & accountability, develop self-responsibility & self-discipline, work smarter, enhance personal effectiveness, and improve themselves measurably, concretely, continuously and routinely. There’s also no police force in the country, that focuses on creating a high performance ethical culture in which police officers can work smarter, improve themselves continuously and creating a real learning organization. Instead, they focus mainly on cosmetic tools, like body cameras, nice police cars, police firearms & tactical weapons, sporadic training, nice pep talks by police chiefs and commissioners, etc. And there is also no police force in country, that has implemented a sustainable corporate governance program. That’s why there is so much conflict of interest, unequal justice, no transparency, prosecutors and officers not being disciplined for their unethical conduct, police investigating themselves, etc. All these issues are heavy violations of standard corporate governance rules. We need to create a high performance ethical culture within police departments across the country urgently, rebuild trust and make a difference sustainably. The result of the implementation of our revolutionary change management and coaching system is a high performance ethical culture, allowing police officers to realize their full potential and contribute effectively, while the police department and the city benefit from increased public trust, safer communities and higher customer satisfaction. This process of cultural change has been described in our article “Why Corporate Governance Fails” . Read also below how we have aligned authentic governance with authentic branding in order to help police officers and police departments to rebuild public trust and safer communities sustainably. Don’t wait, act now, because the police brand across the US is at stake! Improved Perceptions: Citizen’s perception of a police officer’s motives is more important to them than whether or not the contact with the police officer resulted in a favorable outcome. Build Trust: Citizens tend to base their trust of the police and recognition of the officer’s authority on how they perceive the police treat them, rather than how successful they perceive the officers are in reducing crime. Follow the Law: A citizen’s willingness to obey the police and the law is affected by their perception of how police officers treat them. Develop Confidence: While most of the public has a lot of confidence in the police in general, public confidence has been slowly declining since the 1960s—from 60% to 54%. Respect for the police has also been declining since that time. It is clear from this report and from what we have learned from Ferguson, Baltimore,…. that the community’s perception o f the police—the brand of the police department and the brand of police officers-—has a major impact on the police department’s ability to control, prevent, and solve problems (the police force performance). Our authentic police branding system is about fostering your department’s vision, mission, core values, strengths, competencies and the officer’s own personal brand. It lets the community know how much your officers care and are committed and put forth a uniform “brand.” This unique system is based on our 2 new bestselling books “Authentic Governance; Aligning Personal Governance with Corporate Governance“ and “Authentic Personal Brand Coaching; Entrepreneurial Leadership Brand Coaching for Sustainable High Performance“. There is such a need for a complete rebirth of trust in police officers. Somewhere along the line many police officers lost their humility and in doing so they have lost their compassion and empathy, and their inner connection to themselves. Citizens want to know that they can trust the police, and rely on them to be there when they are needed most. Rebuilding trust in the police department starts with rebuilding trust in the police officers. Rebuilding trust in the police officers starts with police officers being true and authentic to themselves. This involves finding the proper balance between their personal values and their behavior/actions. It’s about alignment with themselves. This inner alignment is an important step towards lasting personal growth and reinforcing integrity, accountability, honesty, trustworthiness, credibility, transparency, and personal charisma. Police officers with this perspective on life value and respect others’ lives and create a stable basis for others to feel they are credible, truthful, trustworthy, transparent, and ethical. They will change their mindset, will be less arrogant, will treat people with respect and dignity, will become compassionate, and there will be consistency between their personal brand and their behavior. When police officers have achieved this inner authority, they will have a positive effect on others and dedication of those around them and they will be of added value to society. They will also create a stable basis for effective value based leadership and they will become the CEO of their life. The African American youth must undergo this same process as describe above. This learning process will also help you build a trusted image of your police department. Your police officers will work smarter and enhance customer satisfaction drastically. This will stimulate public trust and loyalty and it will help build safer communities sustainably. Please read this success story; The European Foundation for Quality Management awarded the first Belgium Police Force Heusden-Zolder the distinction “Recognized for Excellence (European Malcolm Baldrige National Quality Award),” based on my unique authentic and holistic methodology. 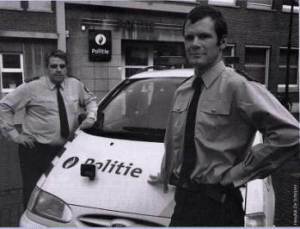 It’s the first police force in Belgium that ever received this prestigious award. Check also our testimonials from United States Air Force and US ARMY . We have also received the highest military recognition from the Special Forces of the Brazilian Army for training and coaching them in visionary & value based thought leadership based on our unique system. This sustainable change program entails leadership training and coaching of African Americans and police officers, redefining the police department’s vision on strategic, tactical and operational level, developing and implementing balanced scorecards on all these organizational levels, implementing sustainable corporate governance, improving business processes, etc. This is a top-down & bottom-up, inside-out, authentic, measurable and holistic approach, and therefore sustainable! This cultural change process starts with an in-house training in your own training room, customized for your Police Department, which can be scheduled at your convenience with your own timetable. This in-house training course will allow the training to be a lot more focused on the specific subjects and skills that are relevant to your Police Department. This means this very interactive and practical course will be prepared to fix your individual issues using real life examples and therefore have the most effect. Delegates will be able to work on current work or examples of work which relates to their roles not generic examples. By involving African American community leaders in this training you will create harmony, better understanding and a culture of trust. Building and implementing a distinctive and compelling police department brand and police officer brand. Creating positive perceptions and emotions about the police department and the police officers in the mind of the community. Aligning police officer’s brand with the police department’s brand in order to develop officer’s engagement and commitment.